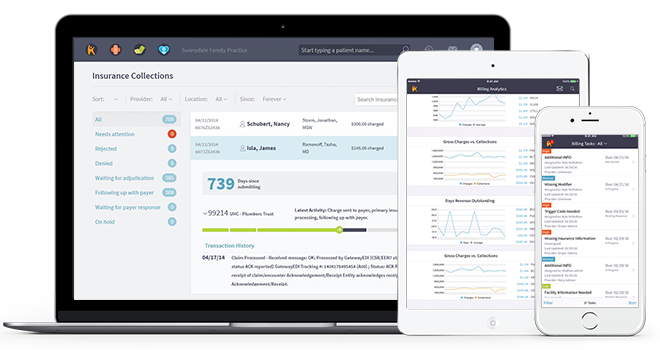 Kareo is the only cloud-based, clinical and business management platform designed specifically for the unique needs and built to enable the success of Family Medicine providers. The platform can be accessed with a single module purchase or through a combination of modules to create a customized solution tailored to the needs of your practice. #KareoChat Discusses What Right Care Looks Like from Your PCP? This week’s #KareoChat host, Melissa VanHouten led a discussion about what right care looks like and why it is so important. Kristi Wallace, FNP-C, of Essential Medical is keeping the focus on patient care with Kareo. Appalachia Medical Clinic found flexibility with Kareo. The result is improved billing and the ability to access incentives. "We have been partners with Kareo for numerous years and we are totally satisfied with how well their Practice Management Program is designed. Their customer service and support staff have been ..."
"I have been using Kareo and it has been a great tool for my practice and easy to use. The support is great. I always get a response the same"
"KAREO IS GREAT PRACTICE MANAGEMENT SYSTEM FOR BILLING CLAIMS TO NUMEROUS INSURANCE COMPANIES. THE CALL CENTER IS ALWAYS HELPFUL AND IF THEY DON'T KNOW AN ANSWER TO MY QUESTION WILL HAVE SOMEONE ..."
"I was skeptical about any electronic medical record at all, until I met with my billers. They told me about Kareo and I was still skeptical until I tried it. Boy that did it! I had a ball and still ..."
"I have been using Kareo PM for about two years now, have been using Kareo EHR for about one year. Among the things I like about both the PM and the EHR is Kareo's customer"
"I had to switch from another EHR to this one, and at first, the transition was bit rough, but now, I see that Kareo really has a lot to offer that the former program did not have, the attestation ..."
"We had Kareo Practice Management when I began my job here. When I received the notice that Kareo was starting a EHR program also I jumped on the wagon right away. I feel like Kareo started at the ..."
"We were able to get up and running on Kareo PM and EHR very fast. They are so responsive and have great follow through. Using Kareo, we’ve gotten to a place where we have very few errors, our ..."
"I am semi retired and only work 1/2 day a week. So it would be very difficult for me to use a program that was very complex. My office provides holistic care by nurse practitioners. Much of what ..."
"I have used Kareo Practice Management for a little over three years. I have been pleased with the information I have with just a click of the mouse and have had no problems with claims submission. ..."
"Our office had been using a billing system that was becoming obsolete and offered non of the advantages that our Kareo system does. Kareo made the transition very smooth! The training staff (Karla) ..."
"We were using a partner EHr which is how we found Kareo. First we used the practice management and found it very user friendly, both for front office and billing staff. Then we found EHr and ..."
"I find Kareo to be straight-forward to use. While every system always needs to be tweaked, I have found the Kareo support help to be very helpful and attentive to finding a resolution to any problem." "I love the way Kareo does the billing and gets it out in a timely fashion. And it's easy to get help on anything that might come up on the billing side. I love the way that you can print up any part ..."
"Kareo is very user friendly. It does just about everything we need it to do. Whenever we have an issue, the support team is right there to"
"I haven’t had to spend much time adapting the Kareo EHR either. The templates are a good fit for my primary care practice, the eprescribing and labs work great, and I really like the preventive ..."
"Kareo is so easy to use, and the customer service and support is outstanding. I had a Customer Success Coach who was there with me through the whole setup, and we talked every week. I love having my ..."